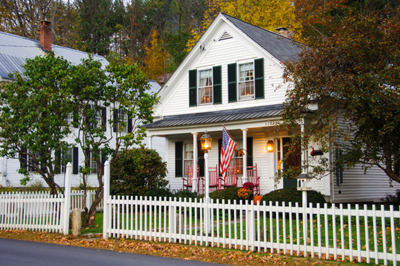 A fence increases security and boosts curb appeal! If you are looking to put your home on the market soon or just looking for a way to boost your curb appeal, adding a new fence is a fantastic way to boost your home’s value and set it apart. Here are some of the many ways that you can design the perfect family-protecting, curb-appeal-boosting, new fence of your dreams. A great way to add curb appeal to your home is by adding some extra vegetation, and a great place to put that vegetation is on a vining hedge! If you install a chain link fence, vines, flowers, and bushes can grow up to cover the surface of your fence to provide you with protection and major curb appeal. Vines are a natural way to block out noise pollution and give you more privacy, all while adding to your landscaping. A vining hedge might take up to a year to fully grow, so start planning early if you are trying to boost your curb appeal before a specific date. If you have an older fence on your property that has seen better days (or decades) it might be time to replace it with a new fence. Your fence is the first impression that people see when they drive by your home, so if it is falling over, leaning, cracking, rotting, broken, or rusted they will assume that things look just as bad on the inside. Make sure that your fence is properly maintained at all times, especially if your home is on the market. The primary reason that you have a fence is to make the boundary between your property and the property of your neighbors clear. If you don’t have a way of distinguishing how much property is yours, prospective homebuyers might pass on your home in favor or one with clearer or larger boundaries. This entry was posted on Friday, February 10th, 2017 at 10:30 pm. Both comments and pings are currently closed.